We never have to shovel the drive to go for orange juice. Bananas grow in the yard and hide the compost pile in the back corner. With the abundance of fresh food we have here, we’re spoiled. The guy down the street has a huge cactus against the house. It blooms profusely with white night-blooming flowers and they turn to red globes later. What are the red globes? A tree beside our house had to be drastically cut back because it was shading the citrus, and the oranges and grapefruit were not happy about that. The tree has five-sided fruit that turns yellow when it’s ripe. What are they? Down the road a way there is a small grove or orchard or forest of tall trees that have reddish, nubbly fruit that grows in clusters. The shell is delicate and covers white pulp and a smooth seed. What are they? The answers are dragon fruit, carambola or star fruit, and lychee. Go farther south in Florida and you can find all sorts of fruity visitors that came to stay. Monstera, jackfruit, many kinds of sapote, and rambutan are good examples. Since they are harvested at different times throughout the year, you can usually find something new in supermarkets or fruit stands that specialize in Latin flavors. Because the world is getting smaller dragon fruit shows up in supermarkets now. So do star fruit and lychee. 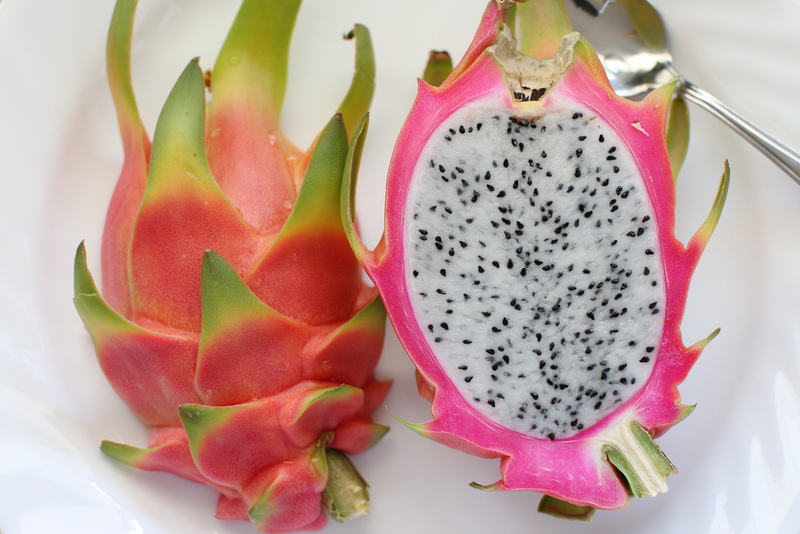 Dragon fruit is one of the current darlings of food faddists who tout it as cures for almost anything that ails you. A ripe fruit gives a little to the touch. Cut it in half and scoop out the white pulp that has black flecks. Eat it. Or make smoothies with mango and/or banana. A few of these cure hunger. Carambola, or star fruit, is best raw. It’s mostly water so doesn’t stand up to much heat but it can be marked on a grill if you do it quickly. Slice it across to make stars or cut each “point” away from the others to form spears. Each spear has a plastic-like membrane in the center. Pull them out with a knife. Lychee is a pain if you want to do much more than eat it raw because it has to come off the pit. Peel the delicate red shell off with your fingers. Score the end and push the seed out. Serve the fruit over ice or enjoy as it is. You can save a step by just popping the peeled fruit into your mouth and working the pit out with your tongue. See how far you can spit the pit. Monstera, the full name of the plant is Monstera deliciosa, looks like a distant cousin to corn on the cob that turned green. You might know it as windowleaf or split-leaf philodendron. It comes off the base when it’s ripe. Don’t eat it until it’s dead ripe and the green scales fall off or the acid might hurt . . . a lot. Then push the kernels off or eat it like corn on the cob. Don’t stand under a jackfruit tree. The fruit has been known to come close to 80 pounds. It has been around India and Southeast Asia for thousands of years. Some varieties are hard, others soften when ripe. Seeds are contained in pockets of fruit. The seeds can be cooked and eaten like chestnuts. Eat the fruit plain or make it into drinks or custards. Sapote comes in white, black, green, and mamay. A Cuban coworker raved about mamay shakes— and he was right. Mamay looks sort of like a sweet potato, but softer and sweeter. Because of so many varieties a safe bet is to ask the person you buy them from how they use the fruits. Rambutan is sort of like lychee’s husky cousin. It’s bigger and the outside is hairy. The name comes from the Malay word “rambut” meaning “hair.” Cut around the center of the fruit and the peel comes off lots easier than lychees. Don’t eat the peel or the seed. It doesn’t taste good and isn’t good for you. We have even more interesting tropical fruits in Florida. Get adventurous.